May 24, 2017 Emily V.
Ever since I was little I've always been into "customizing" my clothes. Although back then my tools were limited to puffy paints and iron-on transfers. Nowadays though you can pretty much get anything you want from studs to patches to feathers and lace. All you really need is a great pair of scissors and some fabric glue. Throughout my life I've cut sleeves off shirts, added/removed studs & grommets, sewn on patches, and even removed embellishments and straps from shoes. I've had some major misses but also some pretty sweet hits. The creative DIY part of me hasn't changed, although I'm a bit more scissor happy these days. If you feel you might be lacking that DIY gene don't worry. Customizing your clothes doesn't have to be a huge task. 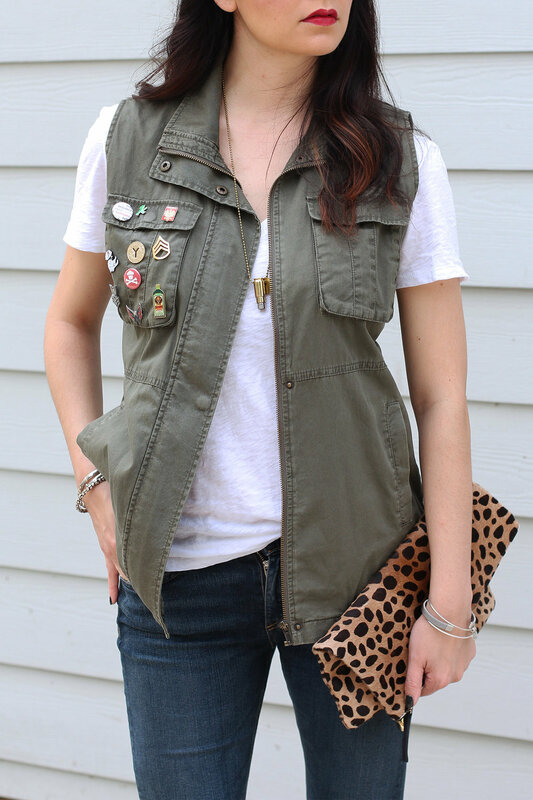 It can be as simple as adding a few of pins to your vest like I did here. Over the years whenever I would see a pin I liked I would buy it. Now I add them to some of my plain jackets or clutches to give them some flair. Adding embellishments or making a modification to an item in your closet is a great way to breathe some new life into older pieces that you may not be that excited about anymore. Throw your favorite pins onto a blazer, vest, or light fabric jacket. Play around with the placement. They don't have to be on the front pocket. Try placing them on the collar or on the sleeve. Turn a standard crew neck shirt into a v-neck. This is a great option for band t-shirts. I get a lot of shirts from concerts and they are so tight around the neck so I prefer to cut the neckline out. Cut the hem of a pair of jeans to create the frayed/raw hem look. After you cut them, throw them in the wash so the threads start to naturally get exposed. It's what I did with these jeans. It saves you money from having to go get them professionally tailored if they are too long. Add some pizzazz to a utility jacket by adding some grommets, studs, or some cool patches from an army surplus store. It's a great way to make things your own and unique. It's a creative way to express part of your personality through your clothes. Best of all, no one else will have your one-of-a-kind piece.